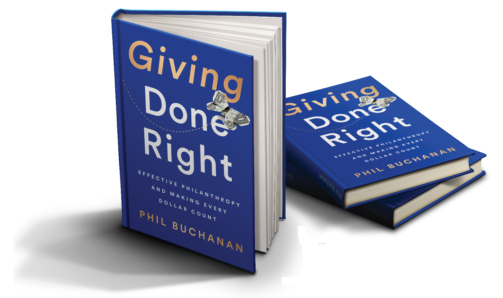 • Daniel X Matz, writing for PhilanTopic, reviews Phil Buchanan’s Giving Done Right: Effective Philanthropy and Making Every Dollar Count, which explores how philanthropists can become better givers. • Buchanan discusses the best ways philanthropists can be smarter about their giving. How can donors come together on this issue? How will collaboration help drive progress on charitable giving practices? • Check out the Center for Effective Philanthropy Magazine on Giving Compass. Back in 2016, Bill Gates, in the context of his partnership with the Heifer Foundation to donate 100,000 chickens to people around the world living on $2 a day, blogged about how raising egg-laying fowl can be a smart, cost-effective antidote to extreme poverty. As Phil Buchanan tells it in Giving Done Right: Effective Philanthropy and Making Every Dollar Count, the idea, however well-intentioned, attracted scorn from some quarters, including Bolivia, where the offer was declined — after it was pointed out that the country already produces some 197 million chickens a year. The episode is a pointed reminder that being an effective philanthropist isn’t as easy as it might seem. And Buchanan ought to know; as the founding CEO of the Cambridge-based Center for Effective Philanthropy for the past seventeen years, he has worked closely with more than three hundred foundations and scores of individual givers, exploring the landscape of American giving, distilling lessons learned (both successes and failures), and highlighting what works and what doesn’t. (Spoiler alert: there’s no single answer as to how to give “right,” but few are better positioned than Buchanan to frame the question.) In this slim volume, he lays out a framework that can help anyone engaged in philanthropy to be more thoughtful, open-minded, and willing to learn, adapt, and keep trying. According to Buchanan, digging in means setting goals, weighing strategies for achieving those goals, evaluating the effectiveness of your giving, and, armed with that information, going back for more. Buchanan’s work with CEP has given him special insight into how philanthropists approach their giving, and he’s nut-shelled a range of smart propositions designed to help individuals and institutions think more clearly about how and where they give. Read the full article about Giving Done Right by Daniel X Matz at PhilanTopic. Learning and benchmarking are key steps towards becoming an impact giver. If you are interested in giving with impact on Family Philanthropy take a look at these selections from Giving Compass. If you are looking for opportunities to take action and give money to Family Philanthropy, here are some Giving Funds, Charitable Organizations and Projects aggregated by Giving Compass where you can take immediate action.